If you’re using Add to Feed, please install Add to All. Add to Feed is a feed enhancement plugin that allows you to easily add a copyright notice and custom text/HTML to your WordPress blog feed. 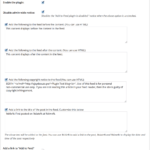 The custom text can be entered before and/or after the content of your blog post. Extract the contents of add-to-feed.zip to wp-content/plugins/ folder. You should get a folder called add-to-feed. Deleting the plugin from the admin area will cleanly uninstall the plugin completely. WordPress Plugin: Add to Feed » Ajay - On the Road called Life! I thought I hit on this issue with my PostPost plugin. Hmmm… Didn’t see that! This one seems to be a baby in front of PostPost. However, I’m planning on making more feed enhancement features. Now, I just need to figure out which features! Feel free to ‘borrow’. 🙂 I’ve not enhanced this in quite some time and always wanted to add a ‘preview’. Sounds a bit like my FeedEntryHeader plugin as well 🙂 – although FEH only adds stuff before the post (though I’ve promised to update it to do it after as well). Anyway, I’ll be interested to see your new features – good luck! I have a few features that I think can work well. Gonna ponder a bit and work on enhancing them.